I loved the article about old garages in April’s OBM, and also enjoyed Bernie Freeman’s memories mentioning the Ace. By courtesy of the Ace Cafe London Archive, I have attached an image of the cafe and garage taken at around the time of the Coronation in 1953, and offer this general history of the site. The Ace’s transport heritage dates back to November 1938, when it was built as a roadside cafe to cater for the hauliers and other road users on the then-new North Circular Road. Once this was established, the owner’s thoughts turned to the motor trade, and in August 1939 he opened a service station with a battery of 10 pumps on adjoining land, along with a spacious washing bay, showroom and repair shops. This was what the Ace Service Station looked like in 1953. Note the various globes on top of the petrol pumps, the relative absence of traffic, the lone cyclist, the ‘God Save the Queen’ banner and the old Leyland lorry in the background on the right. Photo courtesy Ace Cafe London Archive. A fortnight later war was declared and petrol rationing was introduced. Things looked bleak, and in November 1940 the cafe received a direct hit from a bomb and was completely destroyed. A temporary building was quickly erected to allow business to continue, albeit on a limited scale. Urged by patriotic motives, the owner soon turned his attention to war work, and by 1943 new buildings had been erected with machine tools installed, and 120 people employed as direct contractors to the MAP, specialising in the machining of high-tensile steel aircraft components. 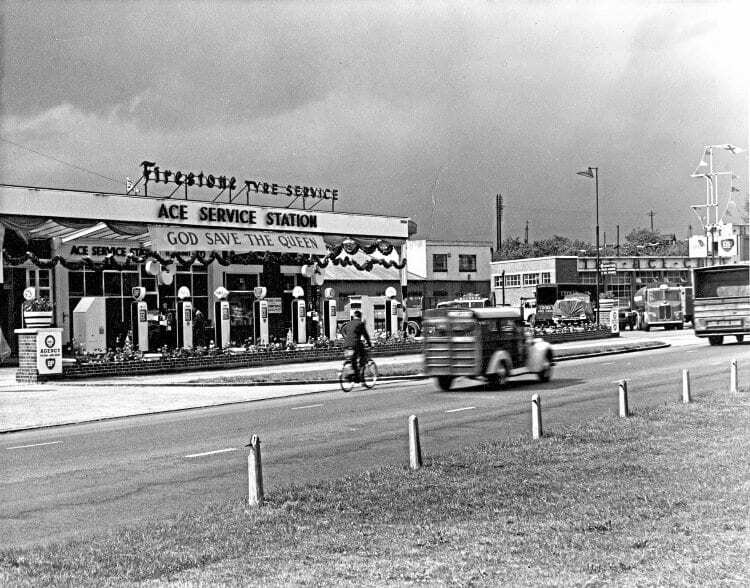 By 1944 the Ace Service Station was operating engineering shops reputed to be the finest of their size in the country. The petrol station remained open during the war period, and was one of the very few that gave all-night service. After the war, the machine shop closed, and once again the dynamic founder of the business had the showrooms redesigned with new plant equipment. Representations to leading car manufacturers led to him becoming a stockist for Austin, Standard, Triumph, Daimler and Lanchester, in addition to being appointed distributor for Citroen cars. The showroom could accommodate 25 vehicles, and was believed to be the biggest in London, with a team of first-class mechanics capable of handling any job, from engine tuning to complete overhauls. One employee, John Wyer, went on to manage several sports car racing teams; Charlie Gee was a Bugatti expert and racing driver Earl Howe was also a regular at the Ace.